NOW OFFERING "EQUINE WALL ART"! 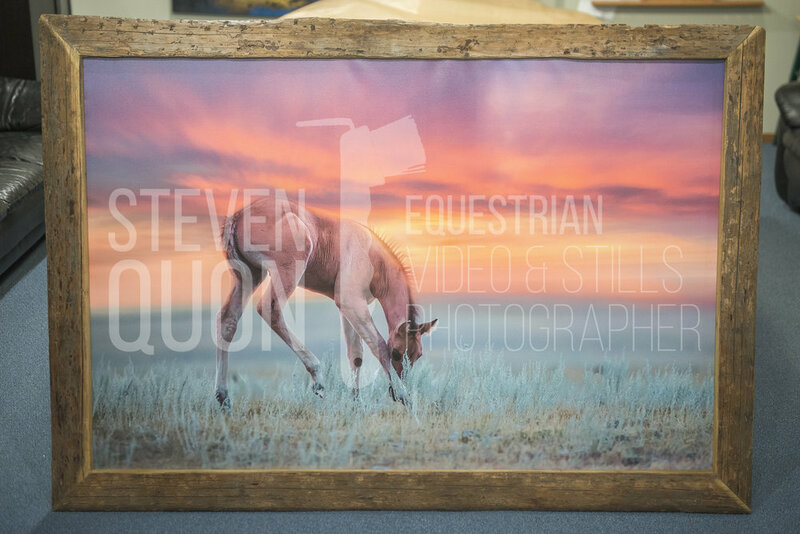 I am so excited as it has been an enormous amount of work and many many hours over the past few weeks to get everything finalized - today marks the official launch of my new Equine Wall Art service! I will be showing more prints as they come in throughout the month of January and perhaps into part of February if I decide to get more or we run into delays. To start, here is my very first piece of equine wall art in 40x60, canvas framed. It was completed earlier this week and it's a big one weighing just over 40lbs or 46lbs in it's box and yes that is real wood. Obviously the finished art work is not watermarked. :) To give you another perspective on just how big it is, it's equivalent to at least a 65" TV, probably closer to a 70" TV due to the frame. This foal was captured at Fleetwood Farms Quarter Horses last July. I did make a small error in that I took this picture before I signed the artwork but now I know for next time. Next up is one of my exclusive sizes purely for horse portraits - 20x40, paper framed. I cannot wait to see this one because it's going to be spectacular. Nobody knows which picture this will be but I will say that it was taken just recently in the month of December. For complete info on my Equine Wall Art service and how to order, click HERE.